These are difficult times. We look around and see conflict. Rancor. Catastrophes, both natural and man-made. But there’s healing to be had. Because when people come together, at one table, to break bread, give thanks and help neighbors in need, something wondrous happens: unity begins. We understand how difficult running a small business can be, even under normal circumstances. We can only imagine how hard it is to come back from the devastation caused by a hurricane. That’s why we are proud to join The Sunday Supper to provide a helping hand for those small business owners who need it. Our community came together last fall to raise much needed funds to help small business owners in the hospitality, farming, and fishing industries get back to normal after Hurricane Florence. Now it’s time to give back. If you own one of those businesses hit by Hurricane Florence, we invite you to apply for a grant through The Sunday Supper to help your operation fully recover. To learn more and apply, simply clink on the Apply link below. Whether your community has experienced a sudden crisis, is weathering a natural disaster or simply wants greater accord, The Sunday Supper can be a significant fundraising event to help those in need or a touching way to heal and unite your community. Or, as in our case, both. Wanting to do all we can to see the remarkable success of The Sunday Supper spread to communities across the country, we’ve created a toolkit that we’re all too happy to share. It will equip you with everything you need in order to plan and implement the event in your area. And having cut our teeth on our own supper, we know you might want some counsel and support along the way — and we’re happy to share that, too. These are our gifts to you. Because together, we can find common ground. Simply complete the form below and we will connect with you. In early October 2016, one of North Carolina’s most destructive hurricanes tore into the eastern part of the state, causing catastrophic flooding and over $1.5 billion in devastation. At the same time, our country and our state were thrust into an acrimonious election cycle, causing rifts among friends, families, churches and businesses. 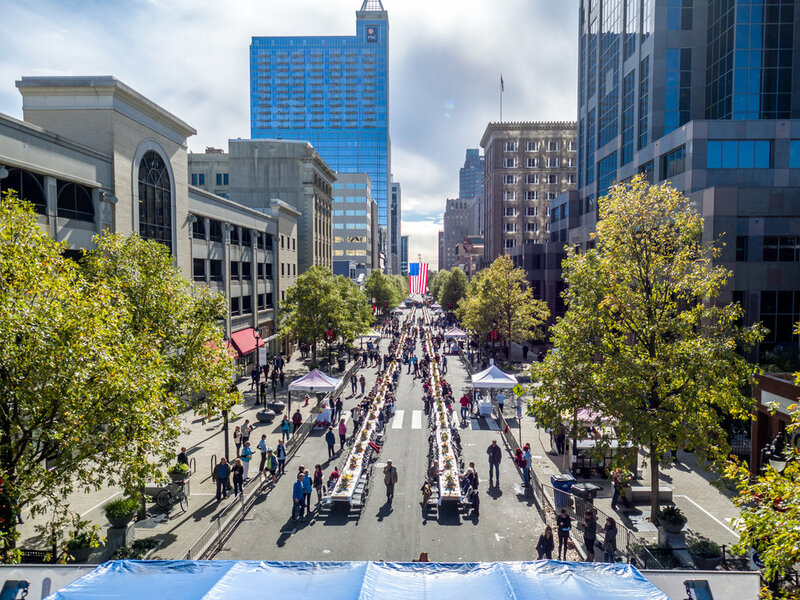 Less than 30 days later, under a 50-foot American flag hung from a city fire truck, 1,000 people joined hands around the largest communal dining table North Carolina had ever set. They put their differences aside to break bread together in support of their suffering neighbors to the east. The Sunday Supper raised more than $189,000 for long-term disaster relief and earned universal praise. Over 300 volunteers made this memorable event possible by organizing, fundraising, hosting and donating goods and services. Our leadership team is an eclectic mix of people, all of whom share in our mission to unite people around the supper table.